I met Learnat Livingston when I was just a teenager, recently married and fresh out of college. That was more than twenty-five years ago. I think he’s an amazing person. 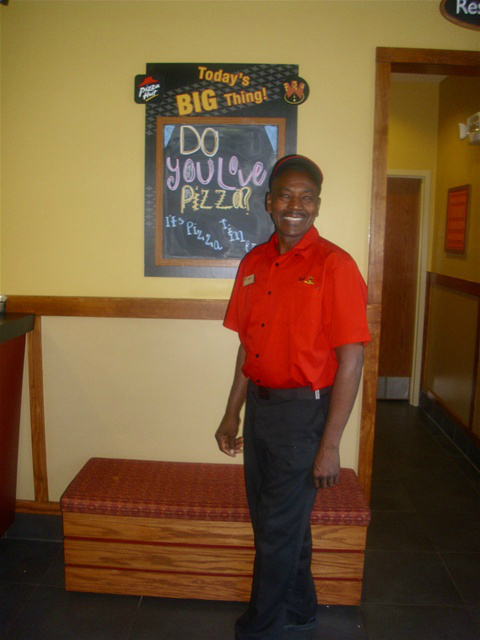 Learnat is not just the General Manager of Pizza Hut in Georgetown - he’s much more that. His name is French and pronounced [Lear - nat] but everyone just calls him Learn-it. I supposed he’s used it by now having lived with it all of his life. “Not everyone likes carrying guns,” I offered. He’s been married to Sherry Livingston for almost 17 years now. They have three children, the oldest being 15 years old. Sherry works in the educational offices of Clemson University. I asked him if he could share a funny story with me about his job. “There’s nothing really to tell,” he says. He just goes to work and does the best he can. Learnat keep’s Pizza Hut’s best interest at heart, even when it means trying to make the most difficult customer happy. I remember one conversation with him as we talked about children with ADD (Attention Deficit Disorder). There are so many of them there. He works with each one diligently and patiently as he keeps them focused. “I would have kicked them to the curb,” I declared. As a person with ADD, I can appreciate his views. I feel blessed to know Learnat and to have had him touch my life in the ways that he has. He’s a genuine personality. So if you ever find your way to Georgetown and hungry for some pizza, stop in and see Learnat Livingston and his 100 watt smile. Tell him the Crankster sent you.